Iron Gates Gorge in Serbia's Derdap National Park separating the the Balkans from Carpathians near the Romanian border. Serbia is a small country located in the central southeastern region of Europe. It has diverse ecological regions that include plains, mountains, forests, rivers, and lakes. The government has protected much of the area within Serbia by designating it as either national parks, nature reserves, nature parks, or nature monuments. These areas are discussed below. Serbia has more than 250 natural monuments. These areas are characterized by being small and mainly unchanged natural formations. The nature monuments are easily recognized due to their unique appearance. One of these areas is the Davolja Varos in the southern region of Serbia. Its name translates to “Devil’s Town” which seems appropriate for the strange rock formations that mark the zone. Part of the Radan mountain, the Davolja Varos is identified by the 202 hoodoos that jut out of the mountain side. The area seems relatively arid although, there are 2 springs located here. Eighteen areas within Serbia have been designated as special nature reserves. The government protects these areas due to their unchanged natural environment which provide habitats to many plant and animal species, some of which are endangered. The Deliblato Sands are one of these special nature reserves, protected in 1965. True to its name, this 115.8 square mile area is covered in sand, steppe grassland plains and steppe forests. The sands are a reminder of the history of the region, which was once a prehistoric desert. The Deliblato Sands are the largest sandy area in Europe and due to its unique landscape, home to several endemic and endangered plants and animals. Of the 900 plants here, species such as the Banat peony, steppe peony, dwarf-steppe almond, and bulrush are endemic to this nature reserve. Endangered animals that live here include the mole rat, desert ant, steppe gerbil, steppe skunk, lesser spotted eagle, and saker falcon. National parks are established due to needs to protect their large variety of ecosystems and biodiversity. These national parks have unique natural elements and cultural value. Serbia has 5 national parks that are open to students, researchers, and tourists. One of these protected areas is Derdap National Park, established in 1974. 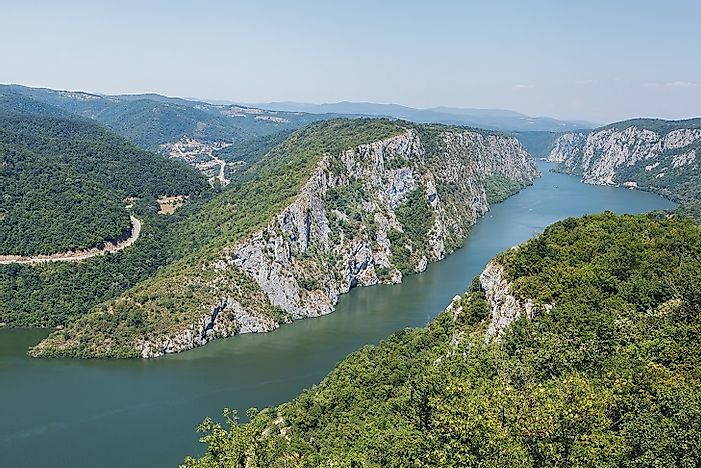 This park runs along the Danube river and contains the ruins of a medieval town, the Golubac Fortress, and the 8,000-year old ruins of a Mesolithic archaeological site, Lepenski Vir. The most widely recognized feature here is the Iron Gates, a gorge with tall rocky sides that separates the Carpathian mountains from the Balkan mountains. This park is home to a vast array of plant life, some of the most unique plants found here are the rustyback, smoke tree, walnut tree, and bell flower. The well-preserved forests, canyons, and meadows provide habitats for white-tailed eagles, Hermann’s tortoise, viper snakes, golden eagles, roe deer, wild boars, lynxes, and swans. Serbia has 12 nature parks that protect large areas of natural ecosystems in order to preserve the biodiversity and beautiful landscapes found within them. Golija Nature Park, established in 2001, is one of these areas. Part of the Dinaric mountain range, the Golija is located in southwestern Serbia. Forests cover this mountain, which is also home to the Golija-Studenica Biosphere Reserve. The Moravica and Studenica rivers begin within this nature park and provide water for the vast amounts of biodiversity. The plants found here make up 25% of the total plants within Serbia, and this includes 117 algae species, 40 moss species, 75 fungi species, and 7 lichen species. Animals living here include red squirrels, water shrews, brown bears, wolves, and over 95 bird species. Although these areas are protected, they do face some environmental threats, particularly from the mining industry, which emits both air and water pollution. Bombing that occurred in 1999 left behind toxins that have seeped into the soil and groundwater supplies as well. Tourism in these protected areas also has a significant impact on the natural habitats; as people hike or walk through the region, they often degrade surrounding plant life.